A Foam Roofing Installation Can Improve the Energy Efficiency of Your Commercial Building. Have you been considering better choices for your commercial roofing? 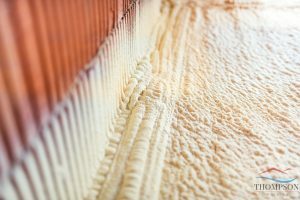 For a system that has easy installation and a seamless finish, consider our polyurethane foam roofing systems! Created by mixing polyol and isocyanate, this roofing material is sprayed as a liquid onto your roof, and then sealed with an elastomeric topcoat for additional durability and enhanced longevity. Designed specifically for commercial roofs, this solution provides exceptional leak protection and resistance to UV radiation. These valuable traits exist thanks to the material’s seamless nature and high surface sheen. If you want expert foam roofing installation in Osage Beach and Lake Ozark, MO, give Thompson Roofing & Reconstruction a call at (573) 789-8367 to learn more. We are here to make sure your building is well protected by a strong, durable roof. 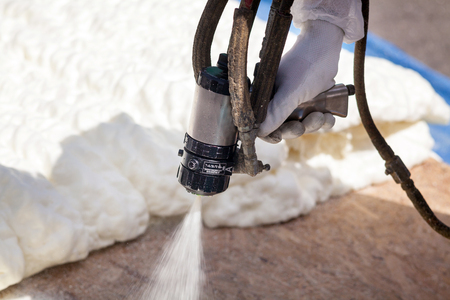 Spray Foam Roofing Is Applied as a Liquid, Which Quickly Expands and Hardens. In order to provide reliable protection from water, many commercial roof systems are covered with layers of roofing material that are connected by bonded seams. Due to its seamless application, foam roofing has none of the common problems associated with seams that grow weaker over time. The flexible nature of foam roofing also simplifies the roofing process, as the material adheres to nearly any surface, and is easy to install around rooftop protrusions such as vents and A/C units. You can count on a lifespan of two decades or more with this lightweight foam roofing installation, and it needs only a fraction of the maintenance required for other commercial roofing systems. We frequently suggest foam roofs for commercial buildings, not only due to the material’s swift and simple installation, but also for its cost-effectiveness. This roofing material offers many perks, including increased energy efficiency, that save you money both in the application and throughout the lifetime of the roof. Since foam roofing is typically white and glossy, it can effectively reflect the sun’s rays. This will make your building cooler in the summer, reduce the workload of your A/C units, and lower your energy bills. In fact, foam roofing can give you a yearly savings of up to 30% in energy costs. Call our roofing contractors now at (573) 789-8367 for a swift and affordable foam roofing installation in Osage Beach and Lake Ozark, MO. Updated on January 8, 2019 at 10:39 am by Thompson Roofing & Reconstruction.